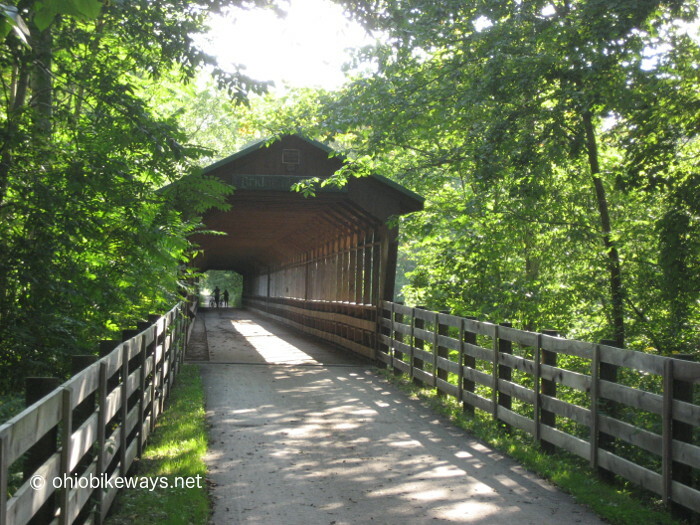 From the Knox County Park District, "...The Mohican Valley Trail will soon be resurfaced from the Bridge of Dreams to the Holmes County line. From knoxpages.com, "...A 're-do' [OB: We're assuming 're-do' means repaving] of the Mohican Trail from the Bridge of Dreams to the Holmes County line is also in the budget. Totman said the park district is trying to get some grant money to help fund the work. "Also related to trail work, Totman said the park district will be buying a large blower that can be used on all three sections of Knox County trail. 'It's so heavy duty that we will be able to take walnuts off the trail,” she said.'" Though it's not official, the new Holmes County Trail section connecting Glenmont with the Mohican Valley Trail in Brinkhaven, is more or less complete. This new asphalt section connects 7.4 miles trail miles to the Mohican Valley Trail. From mountvernonnews.com, "...Recent calls reporting a white powder on the trail were investigated by Lori Totman, director of the Knox County Park District, only to be determined that the current condition of what looks like a white powder is completely normal. "...Recent buggy activity on the trail has caused the small limestone material in the chip-and-seal mix to grind off, making it look like a white powder. The paving will be two and one half inches thick with a finish coat. Actual paving will start next week." The tunnel near Brinkaven under Rt. 62 has been completed. It connects the trail with an unfinished segment of the Holmes County Trail. Facilities: A portable toilet at the Hunter Road parking area. No water source on the trail. Worth Noting: This trail allows horse & buggies and is part of the cross-state Ohio-to-Erie Trail. Elevation: Though mostly flat, there is a short climb at Tiger Valley Road where a railway bridge was removed, forcing riders to descend to street level and then climb back up. The three trails follow the same former rail corridor and comprise a significant part of the larger Ohio-to-Erie Trail, a cross-state bikeway. The Mohican Valley's southwestern endpoint is in Danville, while the northeastern end lies just west of the Rt. 62 tunnel, near Brinkhaven. Where the trail crosses the Mohican River you pass over the 370' long Bridge of Dreams that has been constructed atop an old railroad bridge. This covered bridge is reported to be the 2nd longest in Ohio and the 3rd longest in the nation! The Mohican Valley Trail is horse friendly and had offered an unusual configuration, when first constructed. It was built as two trails placed side-by-side -- one earthen path for horses & buggies alongside a gravel trail for bikers and hikers. In 2015, the trail was condensed into a single 10' wide asphalt trail with a chip-n-seal topcoat, to accommodate horse and buggies (the topcoat helps protect the asphalt from horse hoof wear). The stone topcoat has since been ground off by hoof and buggy wheel, leaving a smooth asphalt surface. However, since a protective topcoat is preferred where horses travel, it could be reapplied sometime in the future. The grade is consistent with a slight descent while traveling eastward. The trail does briefly drop down at one road crossing, due to a missing railway bridge. So you enjoy a nice little coast before you cross the road to climb back up to trail level. As the trail approaches the Mohican River from the west, it begins to ride the crest of a ridge toward the Bridge of Dreams. Passing well above the waterline, the bridge provides great views along its lengthy span. Leaving the bridge and continuing eastward, you pass the Hunter Road Trailhead as you make your way toward the Rt. 62 tunnel and the Holmes County Line. In 2018, repaving is scheduled to repair the pock marks here where horses hooves have worn through the surface. The tunnel is in Holmes County and marks the change in jurisdiction along the corridor as you ride onto the Holmes County Trail. The original railroad tunnel was filled in, only to be dug out later and replaced with a new structure for the trail at the same location. The new structure is quite nice, but no doubt the old one would have provided more character. This next trail section, from the Rt. 62 tunnel east to Glenmont, is a portion of the Holmes County Trail. This segment is finished and was opened to the public in late 2017. 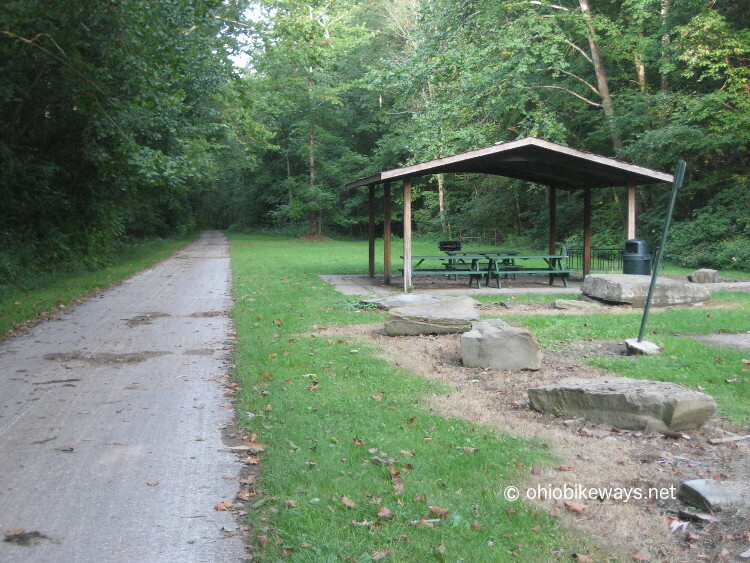 This new Holmes County segment connects another 7.4 miles of finished trail to the Mohican Valley Trail. Cyclists should expect to encounter horses and buggies on both the Holmes County and Mohican Valley Trails. Be sure to take time to check out the posted trail rules.